These advertisement flags are just as significant as the flagpoles they hang from. 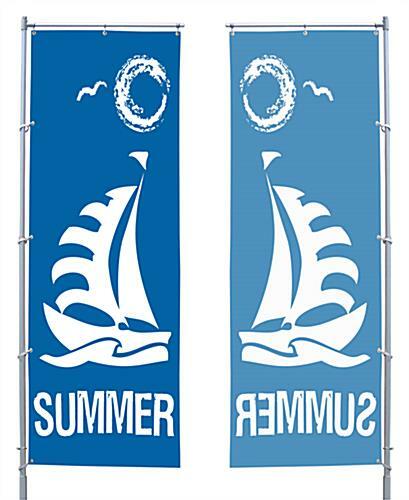 Each of these outdoor banners for the TriPole event systems. This feather signage is custom printed on durable knitted polyester fabric using a specialized silkscreen procedure. The inks that are applied have been specially formulated to resist fading and provide good "through prints" to the backside of the fabric. AdvertisingBannerFlags.com has partnered with one of the world's largest outdoor fabric banner and flag silkscreen printers located in Europe. The custom printed process starts with a specially designed white polyester mesh fabric and presses ink through the silkscreen on one side and through to the opposite side. The ink and knitted polyester are designed to allow the image to bleed through the material for a brilliant reverse image on the backside of the sign. 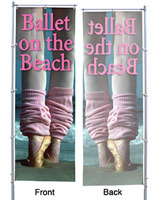 Ninety percent of all advertisement flags are printed using large-sized logo artwork (without detailed text phrases), so the mirrored images are not problematic in most cases. Many business establishments apply these promotional displays to optimize brand recognition when viewed from afar. The overall height of this sign is 94.5".